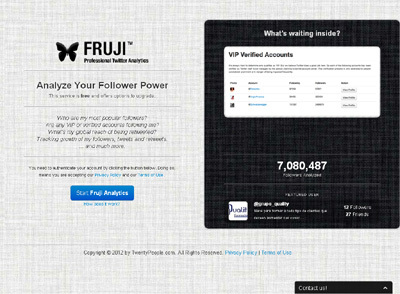 Fruji will analyze your Twitter network and provide you with comprehensive information about your most followed (popular) followers, including VIP accounts, marketing or spam accounts. It will categorize your followers into separate lists, allowing you to fine-tune your analysis. Most networks focus on arbitrary score models that don’t apply in the real world. We focus on verified VIP accounts, popular accounts with hand-selected friends (filtering out spam accounts) and much more. Our service is simple, straight-forward and very clean built.